Before the impact of IMAX there was Cinerama. But widescreen, as we acknowledge it, had been in an progressive experimental stage as far back as 1914, with something called Panoramico Alberini used for an Italian movie entitled II Sacco di Roma; Abel Gance used three cameras for his 1916 Barberousse and then in 1926 did the ambitious Napoleon with triple screens and three projectors; and in 1927 Henri Chrétien introduced the Hypergonar process, forerunner to CinemaScope. One of the first movies to employ large format entirely within a feature as single projection was 1930’s Happy Days using Fox Grandeur, which was later used for Raoul Walsh’s The Big Trail. There were many early processes, a few preceding the above, though, as with Grandeur, they never garnered sustained excitement to warrant monetary investment. Their commonality was sharing the same origin: Raoul Grimoin-Sanson’s Cinéorama, having débuted at the Paris Exposition of 1900 and copied as a nearly mandatory attraction for various future World’s Fairs with 180 to 360 degree projections. This influential gimmick heralding technology would eventually come under the purview of Frederick Waller, who understood its applicatory potential and narrowed it down to a more manageable three-strip projection system to be called Cinerama. 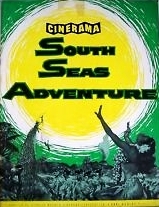 (For more on Waller and related minutiae see David Strohmeier’s enjoyable documentary Cinerama Adventure or visit cineramaadventure.com.) 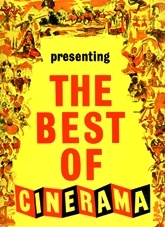 When This is Cinerama premiered in 1952, movie audiences were child-like with their oohs and aahs in what they were seeing, even if what they were seeing were clearly exploitive setups to aggrandize a method that at the start was expensive to show, and would become prohibitively more expensive, and that relatively few theatres would ever be refitted or built to accommodate what were panoramic second-rate travelogues. The fun was being initially overwhelmed by the sense of being involved in the nonsense. 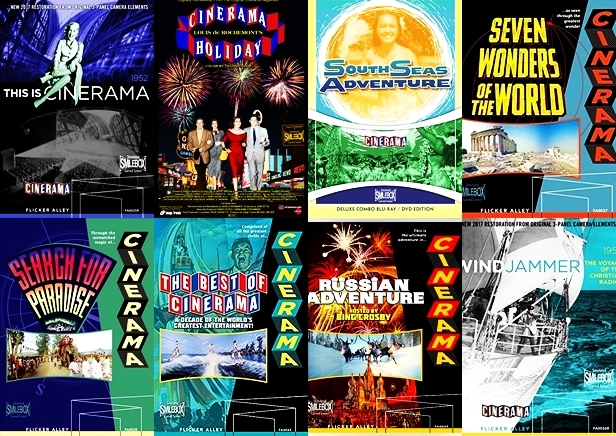 Like 3-D, Smell-o-Vision and Sensurround, few took This is Cinerama, Cinerama Holiday, Seven Wonders of the World, South Seas Adventures	and Search for Paradise as anything more than demonstration. What moviemakers, theatre owners and movie lovers understood immediately was that the size of movies and the screens showing them were about to undergo a dramatic hugeness. Historians always note that Cinerama and the poor man’s follow up CinemaScope were devices to bring back audiences who abandoned their regular movie habits to the comfort of that small box in their living rooms. There was another less-articulated reason for audiences keeping away from movies—nothing much was coming from them after color and air conditioning. Sure, adult-theme movies like Duel in the Sun and A Streetcar Named Desire prompted the Legion of Decency and local censors to action, causing lots of notoriety and a rush to urban box office, yet movie innovation felt stagnated. Filling the vacuum, without Hollywood money, Cinerama was thrilling not only because it wasn’t television, it sure as hell wasn’t like the run-of-the-mill movies, either. With those three projectors and two seams, it was imperfectly spectacular to watch on that enormous screen, as well as exciting to hear the stereophonic blasts, and audiences responded with their pocketbooks to make it the period’s top box office attraction. One of the chief impresarios behind commercial Cinerama, Mike Todd	cheerfully called it “the greatest thing since penicillin” and took pride that it was his son Michael Jr., who, with Harry Squires, photographed the famous roller coaster ride that opens This is Cinerama. If he could Dad might slightly alter his quip: “Michael shot the most famous sequence [that altered the course of] motion picture history for less than it costs me to get a haircut.” (A widescreen “ride” such as this wasn’t a first: back in 1925, in a 63.5mm process called Natural Vision, George K. Spoor and P. John Berggren photographed a rollercoaster as their followup to capturing the Niagara Falls.) With “rama” fever sweeping not just audiences but the international movie industry, even the Russians got into the act with their 1957 ripoff Kinopanorama. 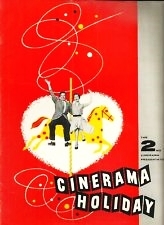 In 1958, a competitor called Cinemiracle was unveiled with Windjammer, not quite duplicating the three camera technique of Cinerama. Applying mirrors to the left and right cameras to reflect images to reduce the irritating seams that would appear due to the three simultaneous projections, some cineastes believed Cinemiracle was less annoying to watch. With only one movie made in the process, Cinerama bought the rights and effectively killed it. 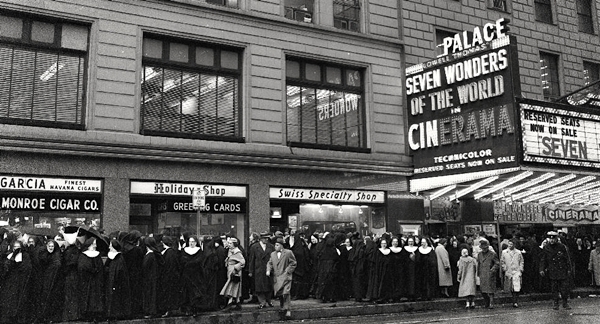 Aside from the rising cost of maintenance, Cinerama had two additional problems. The first, of course, was its limited viewing capacity, with only 312 theatres world-wide equipped to show 3 panel projection. 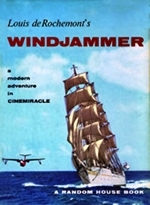 One solution was fairly popular if inadequate—a Cinerama caravan would travel to non-urban areas in Europe and set up a portable theatre with screen, seats, projectors and speakers, and National Theatres, who briefly held American rights to Cinemiracle, reportedly went mobile with Windjammer in smaller U.S. cities. 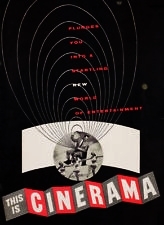 A more grandiose solution came a decade after This is Cinerama opened: Cinerama and Geometrics, Inc. announced plans to build 300 (later exaggerated to 600) theatres, the first of which was Hollywood’s Pacific Cinerama Dome, the venue that premiered It’s a Mad, Mad, Mad, Mad World. The ballyhoo centered not around 3 strip Cinerama, as it had already been abandoned for single projection blowup of Ultra Panavision and Super Panavision, but for its relatively cheap cost: the new dome could be built for $750,000 in just a matter of weeks. (The harsh reality was that it came in at $2.2 million and only a handful of domes were ever constructed.) 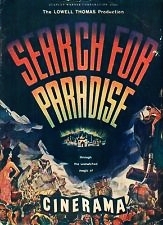 The second difficulty was Cinerama’s inherent cumbersomeness in filming a dramatic narrative: as Mike Todd predicted, one day lovers would need to kiss and there’d be those two damned lines in the midst of all the mechanical clunkiness and during the almost ten years it took to bring The Wonderful World of the Brothers Grimm and How the West Was Won to the screen, Cinerama didn’t invest much in technological advances for its camera system. To bring widescreen to the masses without requiring extensive retrofit or new theatres or trucking-in, there would be a spat of big screen processes. 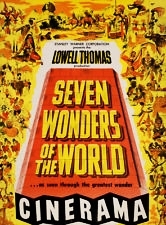 While the best of them—TODD AO, Super Technirama, Camera 65-Ultra Panavision and Super Panavision—remained the preferrred choices for moviemakers and metropolitan showcasing, CinemaScope (its first release The Robe) and VistaVision (débuting with White Christmas) could be much less expensively adapted for many existing non-metro theatres without grievous loss of the big screen “Wow!” factor. Then, beginning as a series of lenses designed to rectify distortion issues that evolved into its own widescreen processes, Panavision became CinemaScope’s successor as 35mm standard. A major setback occurred in the 1970s when the single movie house gave way to cramped multiplexes and out went the larger screens in favor of pint-sizers to provide more product and ticket sales. Movies got “small” again. It took a decade before chains wised up and started to offer bigger screens in the plexes, show 70mm properly and in time install IMAX, the real replacement for Cinerama, confirming technology dictates that size matters. And inevitably dictating this: thanks to aficionado David Strohmeier and his equally addicted foofs, armed with a myriad of corrective software and backed by generous benefactors, and packaging the results in the virtues in Blu-ray and SmileBox, dross-laden Cinerama and its copycats have been restored to a glory they probably didn’t achieve in orginial form, maybe don’t deserve and now enjoyed in the very venue their creators fought against—our home TV screens. Text COPYRIGHT © 2003 RALPH BENNER (Revised 11/2018) All Rights Reserved.